Photo upload size is limited to 1 MB. Many cameras produce image files that are larger than 1 MB. Therefore, in order to use an image, you will often have to save it as a smaller size. There are many ways to process images to a smaller size. Note the image size at the bottom. Rename your image to be more descriptive, if desired. Note: Another technique I use, to bulk edit multiple images at one time to a smaller size is using a feature in Adobe Photoshop Elements. This software application is not included with either a Mac or PC. It is an application that must be purchased separately. What I like about it, is that the Editor has a utility to Process Multiple files at the same time. 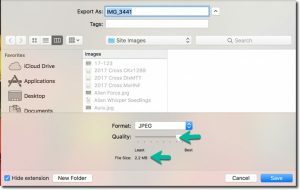 I put all the files I want to process into one folder, point to that folder, and then point to a different folder for the processed, smaller images, and the program reduces all the images at once. If you do not own Photoshop Elements, then the steps outlined above will work for you, one photo at a time.